Naples Italy, Nativity Scene (Crèche), mid 1700s. Milwaukee Art Museum, Gift of Loretta Howard Sturgis, M2006.9.1-.20. Photo by John R. Glembin. It’s that time of year again! 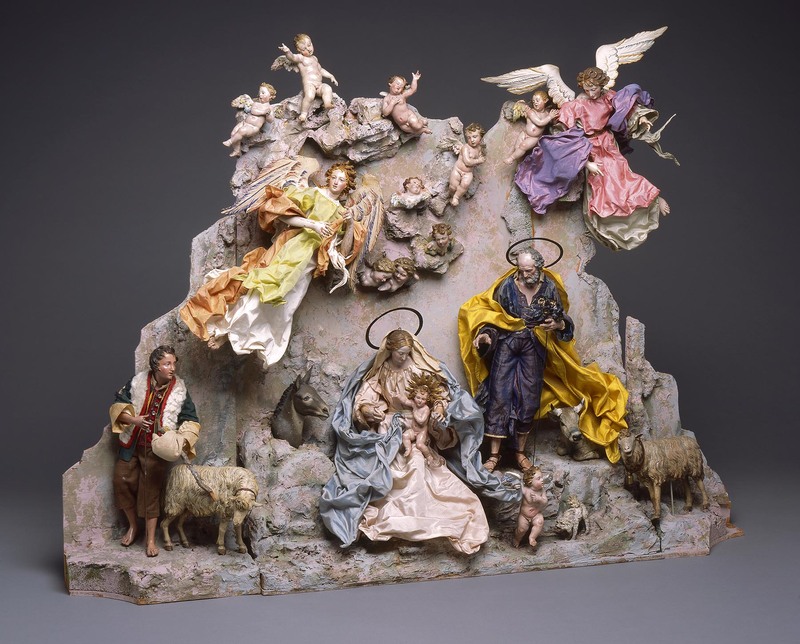 The Museum’s Neapolitan crèche is on view in the galleries for the holiday season. You’ll find it in Gallery 4 of the Collection Galleries, with European art. The origin of the popular Christmas tradition of re-staging the Nativity scene is usually credited to Saint Francis of Assisi in 1223. The custom reached its artistic height in eighteenth-century Naples, when the Museum’s version was made. Neapolitan nobles and aristocrats vied to outdo each other in presenting theatrical crèche (or presepio) displays with elaborate figures clothed in luxurious costumes. Naples Italy, Nativity Scene (Crèche) Detail, mid 1700s. Gift of Loretta Howard Sturgis. Photo by John R. Glembin. 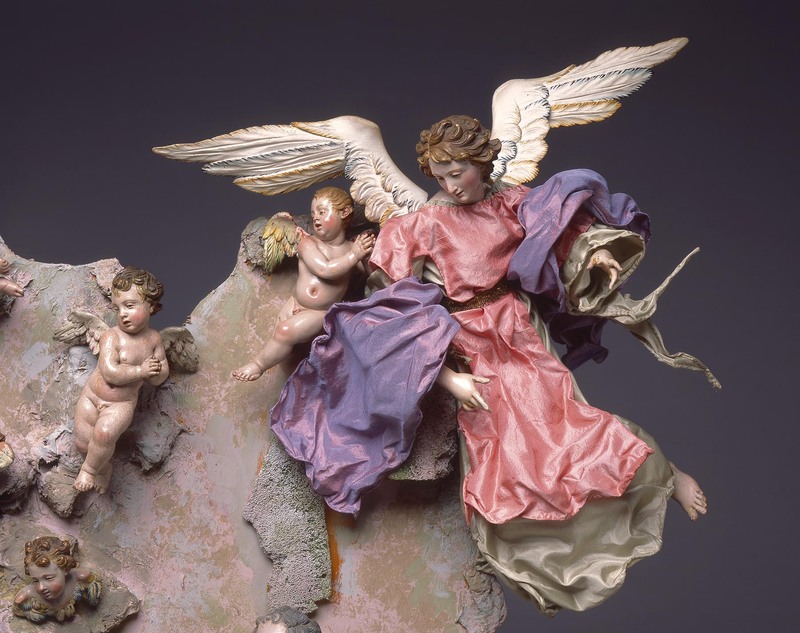 In addition to the Holy Family (detailed at right in the Museum’s nativity), the scenes would include angels, putti, shepherds, the Magi, and a host of barnyard animals. The most elaborate scenes would include daily life in Naples, such as the market, resulting in a lively scene mixing the sacred and the secular that could fill entire rooms. Even King Charles III of Spain, who in 1734 added Naples to his domain, took up the hobby popular with the Italian aristocrats. At its height, his collection included almost 6,000 figures! In the 18th century, the figures were posed in intricate settings built of cork, wood, and plaster that incorporated elements of the landscape of southern Italy. Few of these fragile stages survive. The display that the Milwaukee Art Museum uses is a 20th-century creation. To see what a more historically accurate setting would be, see the installation re-created by the Carnegie Museum of Art in Pittsburgh. The Carnegie website also shows details of their presepio, which illustrates the range of characters you could find in these installations. The figures themselves were crafted by some of the most distinguished artists of the day. The faces, known for their lively expressions and delicate features, are not molded but are one-of-a-kind sculptures. Bodies were usually made of hemp wrapped around a framework of iron wire that allowed the owner to vary the pose and posture of the figure. The heads and limbs were generally made of painted wood or terracotta. 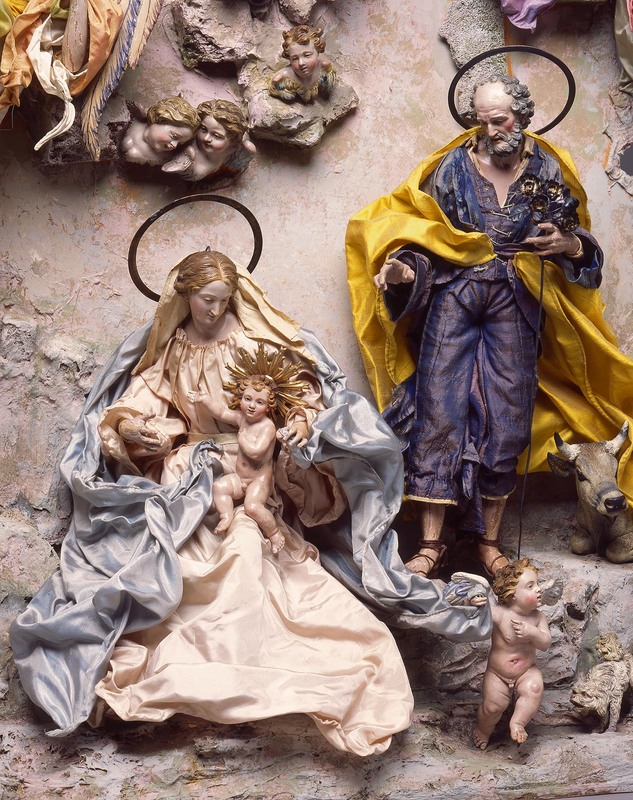 The crèche figures were first placed on display in the Milwaukee Art Museum in 2005, and in 2006, Mrs. Loretta Howard Sturgis kindly gifted the figures to the Museum. Her mother, Mrs. Loretta Hines Howard, gave the Metropolitan Museum of Art in New York over two hundred Neapolitan crèche figures, which they also display each year during the holidays. But why travel to New York when you can see Neapolitan crèche figures right here in Milwaukee? When you stop by, make sure to look for the little dog, the favorite figure of many visitors. Naples Italy, Nativity Scene (Crèche), mid 1700s. Milwaukee Art Museum, Gift of Loretta Howard Sturgis. Photo by John R. Glembin. This entry was posted in Art, Curatorial and tagged 18th Century Art, Christmas, European art, Holidays, Italian art, Nativity scene. Bookmark the permalink.